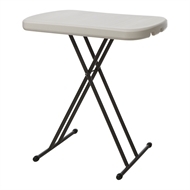 A versatile, sturdy table perfect for picnicking, barbecues or comfy tv dinners. Designed with a solid, aluminium, adjustable frame with three height adjustments, this table is perfect for any application. A durable construction with a resin table top, Marquee's resin table opts for ideal use in both outdoor and indoor environments, folding away neatly for easy storage when needed.